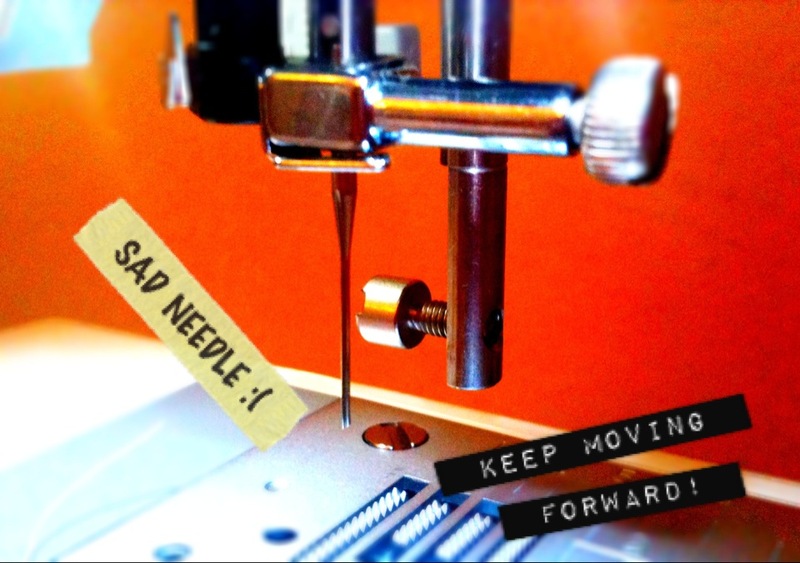 A not-so-great sewing milestone | Sew Lindsay, Sew! Funny story! After giving myself that elaborate “keep moving forward” pep talk, I closed my laptop, started working on a project and promptly broke the sewing machine needle for the very first time! It was a stupid mistake that I’d read about thousands of times in the manual, yet it still happened. I’ll never forget to remove the zipper foot again! 1) Watch that “Keep Moving Forward” clip for the zillionth time. 2) Pull out the manual and learn how to change the needle. =) Hah! This happened to me and it was SO sad because I was just using Eric’s little sewing machine (like the mending type) that he had when I was making a yoga mat bag…and I broke the needle the FIRST TIME I ever tried to use it. Boo. I can’t wait until we have more space and I can get a sewing machine and have wonderful sewing adventures like you!! good movie quote! from a great movie too! sorry to hear that you broke the needle. always a little daunting to change for the first time, but once you do it you’ll realize how easy it is! don’t worry too much, blogging isn’t the end-all be-all. hope things are looking up for you now! It also depends on how old that needle was. If you have used it for other projects it might have been weak. Time to figure out how to replace it now.